ne of the few things my conservative, aging father and I have left in common is baseball. Living in two different continents, divided by time, culture, and political inclinations, we have little we agree upon other than that Choo Shin-Soo has a fantastic arm. Last summer, during my annual visit to Korea, I dragged my dad to a KBO game, a shy man who has always loved baseball but no longer likes doing things alone. We live in Daejon, a mid-sized city in the heart of Korea, about two hours south of Seoul. Our team is the Hanwha Eagles, founded as the Binggrea Eagles in 1986. Bingerea, the dominant ice cream and cold confectionery company of Korea broke with Hanwha in 1993. Since then, the Hanwha Group has taken over, with a slew of its businesses, including explosives, life insurance, hotel and shopping centers, and solar power companies chipping in to sustain the franchise. My dad and I take the hour-and-a-half bus ride to the stadium, crammed in like sardines with a bunch of other sweating summer bodies. Retired and on a tight pension, he refuses to take a cab, which would have been about US$12—of my own money. The bus ride gives me plenty of time to rethink my decision of father-daughter bonding. I’ve wanted to reconnect with my father, to find some sort of middle ground where we can coexist that doesn’t involve “debates” surrounding feminism, unions, or socialism (all ideas I support and he abhors). Last summer, when he visited me for only the third time since I moved out of my parents’ home in my early twenties, we filled in the awkward silences between us by watching Kansas City head for the World Series. We had accidentally stumbled upon an interest we forgot we had in common. We talked about the 1980s’ St. Louis Cardinals, our home team in the first U.S. city we’d ever lived in. I don’t remember it, but my dad says I watched Cards games with him on TV like a person obsessed, unable to tear my five-year-old eyes away from the acrobatics of Ozzie Smith. Would you like fried chicken, or fried chicken? Comforted that I am doing the right thing, I look forward to the game, hoping my dad and I can finally relax together in each others’ company on a lazy summer evening. The pace of baseball is one of its biggest allures, at least to me. I love the slowness of it, the tediousness of it that represents to me long summer days of sitting around, not doing much, and calling it a good day. Just like a second-stringer, or a bored outfielder who sees no action an entire game. This illusion is shattered the minute we flood out of the bus. 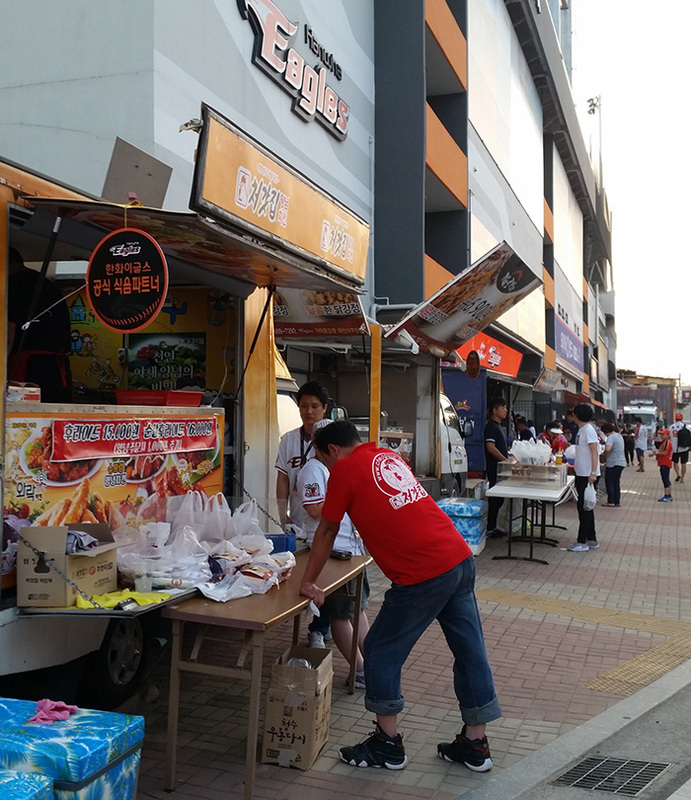 The walk up to the stadium is lined with at least a dozen shouting food vendors, all displaying incredibly neat packages of boxed fried chicken. Korea is fried chicken obsessed, making U.S. baseball’s loyalty to hot dogs and cracker jacks seem like a terrible historical decision. The game has already started (that’s how long we were on the bus) and I haggle with a vendor for a discount. He comes down on the price and throws in a free bottle of Coke. My dad watches from afar, embarrassed by my haggling which he sees as crass and unladylike. Inside, we are greeted with the reality of KBO baseball culture. The cheering is intense and impressive in its mass uniformity. There are distinct cheers for each player, for each play (strike outs, double plays, end-of-innings), for the team as a whole, as well as organized heckles for the other team. “Throw the ball forward! You’re embarrassing yourself!” they chant when the opposing pitcher fails to pick off a runner. There are cheerleaders and drums and inflatable Q-tips everywhere, with people waving them around in unison to different songs as if they were practicing for the opening ceremonies of the Olympics. The fan food game is particularly strong. 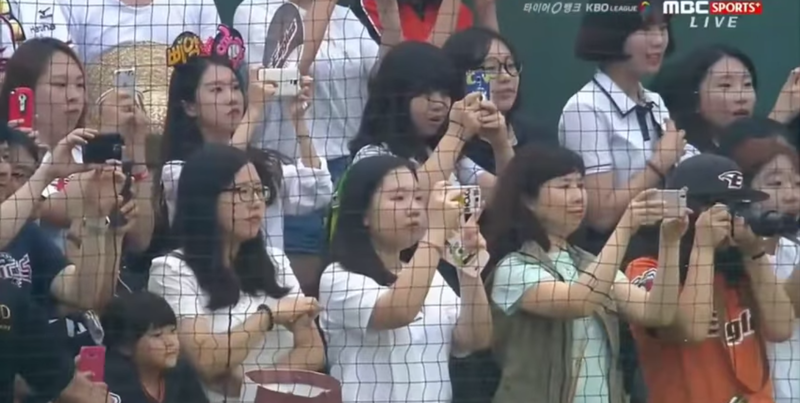 As I’ve written about before, there are few limits on what can be brought into stadiums in Korea, and I see families with trays and trays of food. Not only the obligatory fried chicken but also kimbab, soon-dae (blood sausage), dduk-bbok-gi (spicy rice sticks), fresh fruit, chips and crackers, ice cream, and on and on and on. An entire portion of the stadium is devoted to seating with tables, to spread out all your food and drink in comfort. We are the odd couple out, a grown daughter and her father who have chosen to attend a game together but say nothing to each other. We don’t know the cheers, so I carefully try to start a neutral conversation with him. I ask him when was the last time he attended a baseball game. He thinks about it for a moment before guessing that it had to have been before I was born, with my mom. That would make it over forty years ago, he calculates. He is taken aback by how long it’s been, I can tell, because he purses his lips and says nothing more. Years ago, when I first left home to study in the U.S., my dad had predicted that there would come a time when he and I would run out of things to talk about. At the time, I thought he had been commenting on my interest in the humanities, whereas he was a hard scientist by training. It has been almost twenty years since I left home, and I see now that he was talking about something bigger than our career paths. I wish I could tell him about my last time at an Eagles game, but I can tell he doesn’t want to dwell on the past. I was in college, still living at home. Friends and I would go in the middle of a weekday, and we’d be seated amidst mostly drunk and belligerent men, whose creative cursing at players—both our own and opponents—was closer to poetry than profanity. This was right about the time soju was banned from stadiums because fans kept chucking the empty glass bottles at players. Not on the field; at players. I remember the concessions vendor trying to sell us contraband soju, stashed at the bottom of her cooler. My father, at age 65, is one of the oldest people here. Korea provides its senior citizens with all sorts of public perks, and one of the reasons I got my dad to agree to attend a game in the first place is that those 65 and older qualify for a 50% discount. He can also ride the subways for free, and get 50% off at national parks, museums, movie theaters, etc. It’s the sort of social welfare program for the elderly I am a big fan of and he finds a drain on the system, despite the fact that it benefits him. From what I see, there are only two other people in the entire stadium that are older than my dad. One is Hanwha’s current coach, the legendary Kim Sung-Geun, now 72 years old. Known for his military-style training and fixing up bad teams, Kim will be taking on his fifth managing job in the KBO (a league that usually has about ten teams in play). The other is Hanwha Group’s CEO, who is currently out on probation while he is serving time for embezzlement and fraud. He is attending a game for the first time in over a decade, to boost support of his flailing team as well as his own tainted image. You wouldn’t be able to tell from the fanatic cheering and eating, but the Eagles are one of the worst team in the KBO. Their last playoff appearance was in 2007, and they’ve come in dead last the past three seasons. But it’s clear that fans don’t care about winning—they care about participating in baseball culture. Hanwha is known for their ability to keep a large fan base despite their pitiful record. In many ways, they are the most American of teams. Owned by a mega-conglomerate, they have practically unlimited funds, a significant advantage (one would assume) in a league without salary caps or luxury taxes. They pride themselves on poaching, with said funds, established talent. Hanwha are also experts at selling off established talent when profitable. Hanwha was the home team of Ryu Hyun-Jin for six seasons, who is now a starting pitcher with the LA Dodgers. Ryu’s record-setting posting fee of over US$25 million has been largely responsible for the upkeep of the stadium and the team since his departure in 2012. Posting fees are an agreement between the MLB and the KBO (and Japan’s NPB) that prevents the MLB from draining the league of talent, and Hanwha’s record-setting deal with the Dodgers has changed the stakes of the game in Korea. Hanwha was also home to former Dodger Park Chan-Ho after his retirement from the MLB. For comparison, Kim Tae-Gyun is currently the highest paid KBO player, banking about US$1.5 million a year. He is the only KBO player topping $1 million in 2014. Kim, Hanwha’s star slugger since being drafted number one overall in 2001, was recently coaxed back from a stint in the NPB with this record-breaking salary. The average KBO player’s salary is a little over US$100,000, the highest it’s ever been, with plenty of players making US$30,000 or less. The failure of Hanwha suggests that the American model, of buying talent and recruiting popular names, may not work so well in Korea. Of course, I mention none of this to my dad, who is a firm believer in capitalist development, despite the fact that such a philosophy is directly responsible for his forced early retirement and tiny pension. If he lived in the states, he’d be one of those weird non-white, self-hating Tea Partiers, angry at all the wrong people (women, immigrants, the poor) for all that his life didn’t turn out to be. Though our team may be suffering, the fans are having a riot. Part of KBO’s success is due to the fast pace of the game. KBO has always been a small ball game, and it’s a hitters’ league with tons of action. 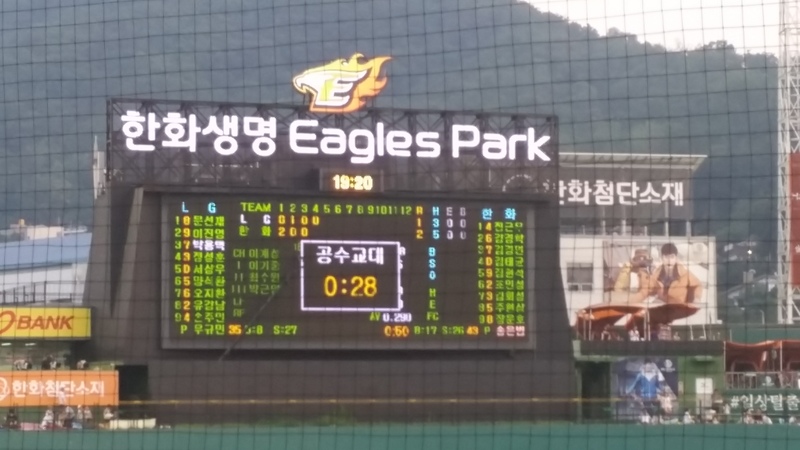 To ensure the games do not go on forever, the KBO implemented “speed up” rules. These rules enforce time limits between innings (2 minutes) and during pitching changes (2.5 minutes); that hitters must step up to the plate within 10 seconds of their introduction and keep at least one foot in the box the duration of the at bat; and that hitters must run, not walk, to first on walks. There are various fines charged for violating any of the above. Curiously, there are no instant replays shown in the stadium (though the KBO started instant replay reviews last year). But even with these rules, the games still clock in at an average of over three hours. Of course, the 2.5-minute pitching change is made easier by the fact that the new pitcher is chauffeured to the mound in a Volkswagen Beetle. VW is a Hanwha sponsor this year, and a slick black Beetle with tinted windows drives in and out of the left field dugout for every single Hanwha pitching change. (The opponents’ pitchers must walk, of course.) It’s kind of the best thing ever. That is, until I spot the row of robot fans—fanbots—in the outfield. Implemented last year with the idea of bringing the game to fans who can’t be there in person, the three rows of mannequins are equipped with LED boards that fans can control online to display certain cheers. A few of the fanbots also have screens for their faces, allowing online fans to upload their own faces onto them. I’m too far away to see if any remote fans are participating, but the fanbots do stand up during our at bats and sit down during the opponents’. I wonder what my dad is thinking of the game so far, of how much has changed, of being here with me. I look over but can’t read his eyes anymore. They are cloudy, the onset of cataracts that he has scheduled for surgery in the spring. Despite all that has changed since I was last here, Hanbat Sports Complex is basically the same. The stadium has the same concrete façade from when it was first erected in the 1960s and seats a modest 13,000 people. Minor upgrades include one flat screen and a whopping six skyboxes. The most recent renovation actually got rid of more individual seating in favor of putting in tables. In Korea, baseball remains a distinctly working class sport. By working class I mean that it is accessible to the general public. Tickets are affordable, and so are concessions. Our infield tickets, a dozen rows from the dugout, are only KR₩10,000 (US$8), or half of that if you’re over 65 like my dad. A table seat will cost you a couple of bucks more. There are discounts for fans with disabilities, families with 3 or more children, and military personnel. Our plastic liter of beer we bought in the stadium was KR₩4000 (US$3). Through the eyes of an MLB fan, all of this may be regarded as KBO’s under- or un-development as a sports league. But I see the thousands of devoted fans around me and I think it may be the other way around. Whereas the MLB, like all professional sports in the US, has opted for capitalist expansion only, the KBO has chosen to stay the same. Across the league, there are no bazillion dollar, tax-payer-subsidized stadiums that tax payers can’t actually afford to attend; no astronomical admission prices that have transformed traditionally working-class sports into corporate hobbies; and no bloated earnings for owner-bullies who threaten to or actually do move teams unless guaranteed a multi-million dollar profit. They have focused on growing the sport and the fan base, not profit. Yet, it hits me that all that I see in front of me is tainted by my time away from Korea. I wonder if I’m romanticizing KBO, a league that underpays most of its players in the name of playing for the love of the sport. I realize I’m comparing everything to a North American standard, even my own father. The gulf between us is not that we have differing views of the world. It’s that I have chosen to root my life in North America, thousands of miles away from my parents. I have chosen to not live near them, not even on the same continent as them. The fact is, despite my annual visits, we are no longer a part of each others’ lives, and we haven’t been for the last twenty years. I am overwhelmed by too many memories, colliding with too few. I look around and take it all in, the fact that I have returned to the same stadium from twenty years ago, that I am here with my dad, that we haven’t done anything, just the two of us, for as long as I can remember. My dad and I sip beer and watch together in silence as the Eagles rally from behind to break their 7-loss streak. At least this one night, we are able to suspend our differences and focus on all there is to take in of the game and its fans. I take a selfie of us, and he complains that he looks too old in the picture. He has more wrinkles than even last year, tipping him over from sage older gentleman to elderly grandpa. It is hard to witness one’s parents age, and the process is exaggerated by the fact that I see them so infrequently. Every time I see them, they seem to literally shrink. I worry constantly about their finances, their increasingly reckless diets, how they are readjusting to my dad being at home all the time since his retirement. Suddenly, I am the nagger in the family, picking up after them and chiding them to eat better. I’m not only the nagger, I am the stranger telling them how to live their lives. At the end of the game, I don’t ask if he wants to take a cab. We wait in silence at the bus stop, content in the way sports fan are after watching a good game. On the bus, a young man stands up so my dad can take a seat. A year ago, he would have been offended. Tonight, he thanks the man and sits. It is nearly midnight when we get off at our stop. It’s dark and muggy, the summer humidity refusing to budge. On our walk up to our apartment complex, I ask if he’d like to attend another game together. Got a little misty at the end there. Beautiful story Serenity, thank you.